ArtRage is a very accessible and easy to learn art program. It’s also a lot of fun, so children and young adults will enjoy experimenting with it. ArtRage replaces the need for a large stock of traditional media, and it completely avoids paint all over the tablet or crayon on the carpet. If you’re a parent or a teacher, you probably know just how much mess a child can make far too well. Kids generally enjoy the Glitter, Gloop pen, Sticker Spray tools, Stencils and tracing features, as well as the ability to mix up and erase paint. The best way to get the started is just to point out the Oil brush, get them to pick a colour, then get them to mix in another colour – they can usually take it from there! 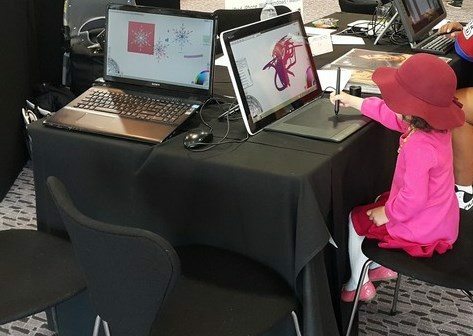 ArtRage is recommended by Intel’s Education program, which also suggests some example lesson plans that incorporate ArtRage in Math, Art and Science. Sophisticated functionality simulates real-world art tools. Powerful tools unlock students’ creativity. Useful at all grade levels—students can start at the finger-painting level and build sophistication. Inexpensive—with no recurring supply costs, teachers can afford to engage encourage students’ artistic endeavors, even as many art programs are being underfunded or cut. Students can use the tool to illustrate their writing or draw diagrams for reports. Require zero set-up and clean-up time. More Lesson Examples: Crazy for Education: ArtRage for iPad intro video and lesson plan.